Try this eggplant involtini recipe and enjoy the delicious, cheesy ricotta stuffing and flavorful tomato sauce. Trim the stem end of each eggplant. Slice them lengthwise using a mandoline or a sharp knife. The slices should be ¼-inch thick. Sprinkle them with sea salt on both sides and set aside. Spray a frying pan with some oil. Add the eggplant slices and cook them on both sides – about 1 minute per side or until they get soft and easy to work with. 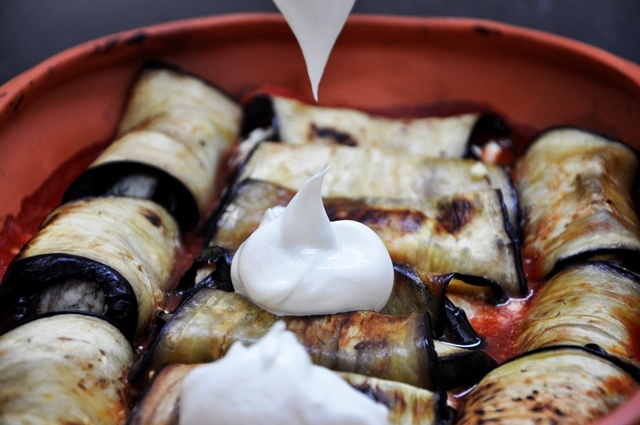 When all eggplant slices are cooked, set them aside in order to let them cool a little bit. Meanwhile, add ricotta cheese, feta cheese, chopped dill and thyme in a bowl. Mash them using a fork. Add more salt if needed. Start stuffing the rolls. Use 1tbsp of cheese mix per roll. Add peeled tomatoes with sauce in a casserole dish. Place the rolls on top and squeeze them together.